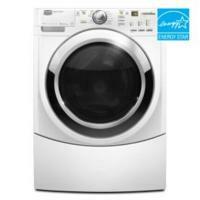 Need Maytag Performance Series MHWE500VW Washer Reviews & Ratings? The Maytag Performance Series MHWE500VW is a step up from the MHWE300VW in that it offer steam functionality. Considering it adds this functionality for a few hundred dollars, it makes a great washing machine even better. The Maytag MHWE500VW offers SteamClean Option and Steam sanitization cycles. This washer comes in just under $1,000. Maytag has long been know for their dependable commercial washing machines and has passed on its experiences to its consumer line of products. The Maytag MHWE500VW offers Maytag Commercial Technology (MCT) which generally includes more robust components and dependability. At 4.1 Cu. Ft. this washing machine is sizable and should have no issue washing King Sized comforters and small rugs. Considering the larges front load washers generally don't exceed 4.5 Cu. Ft., this washer is quite adequate for most family applications. Overall expert and user reviews for the MHWE500VW are excellent, with most pros revolving around the washer's energy efficiency, quiet operation, high spin speed and large capacity. Other notable Maytag MHWE500VW features include the Maytag QuietSeries 300 sound package and Smooth Balance Suspension system which dramatically help reduce vibration and noise. This makes the MHWE500VW very suitable for second story installations. This Maytag washing machine also offers intelligent sensor to regulate water levels and temperature control, which essentially customizes cycles based on load size and soil level. #1) Steam Features: Steam functionality is the latest rage in washing machines. Until recently, steam cycles were only available in the most expensive models. The MHWE500VW breaks the barriers and offers one the most affordable steam equipped washing machines on the market. At under $1,000 this is a great buy. #2) Great Cleaning: SteamClean technology dramatically cuts water usage and high temperatures help get out some of the toughest set-in stains. Intelligent sensors help promote constant cleaning. If you have a family, especially with young children, you'll appreciate this washers National Science Foundations (NSF) Certified Sanitary cycle to make sure that 99.9% of household bacteria is eliminated. #3) Great User Reviews & Expert Reviews: It's tough to find many negative Maytag MHWE500VW user reviews on the web. In fact this washing machine has been recommended by a leading consumer reports magazine recently. #4) Huge Capacity: At 4.1 Cubic Feet this should meet the demands of larger families without issue. Smaller families will also benefit from capacity by requiring less frequent loads, a potential time saver. #5) Smart Features: Sensi-Care system adjusts cycles according to laundry soil levels. This helps take some of the guess work out of cycle selection. Maytag IntelliTemp automatic temperature control adjusts water temperature according to soil level. #6) Energy Saving Features: Saving energy is good for both the environment and your wallet. The Maytag MHWE500VW allows you to do both with an Energy Star rating of approximately 160 kWh/year, which by all means is super efficient. The Maytag IntelliFill system makes sure your loads receive the proper amount of water, but no more than necessary. This feature is commonly reserved for more expensive machines. #7) Ultra Quiet: If you can't stand the sound of your washer or need it to be quiet, the Maytag MHWE500VW washing machine has figured out the right equation. The QuietSeries 300 sound package coupled with Maytag's Smooth Balance suspension system make this washer very quiet, as noted in most user reviews. The Maytag MHWE500VW is a solid machine. This washing machine is only avaiable in white. Strong Recommendation If you're looking for the efficiency found with Steam washing technology at a bargain price, you'll find great value in the MHWE500VW washing machine. Most families will find the size above adequate and be happy with this washer cleaning performance and reliability. If you don't require a steam cycle and want to save some money, be sure to check out the Maytag MHWE300VW Review.